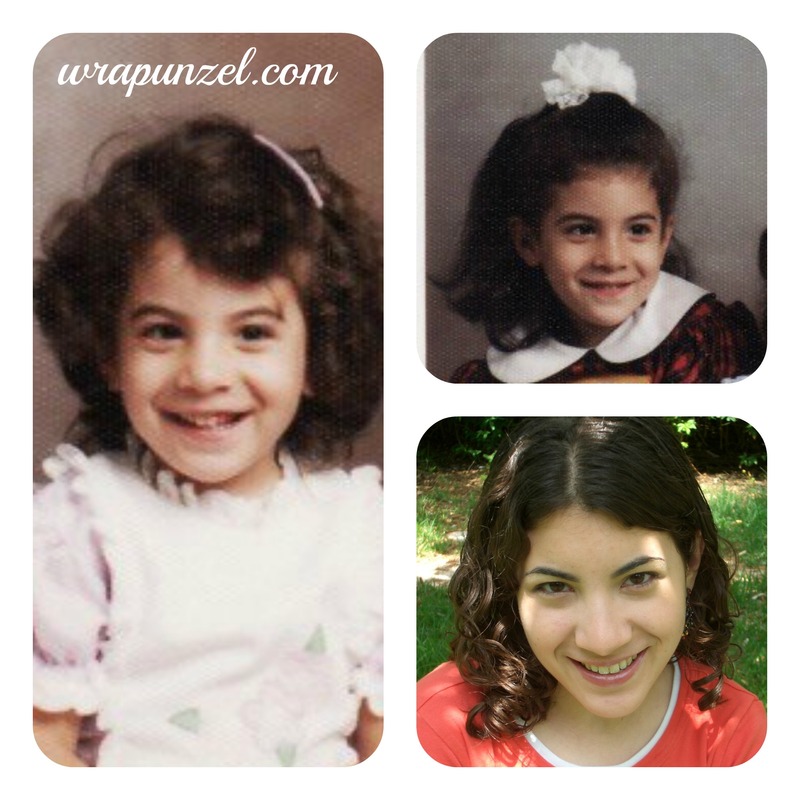 I’m majorly happy to introduce you to Tamar Adina from Chicago, one of our new FACES OF WRAPUNZEL ladies! 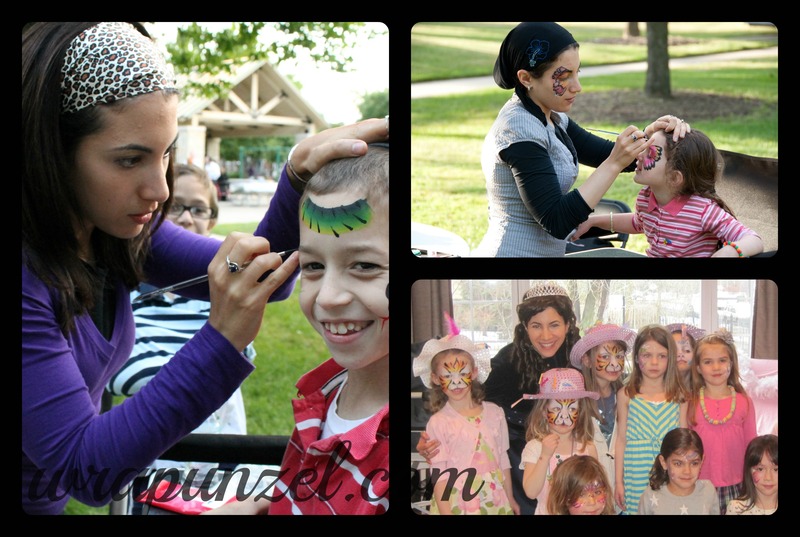 She’s a teacher, artist, makeup/face painter/henna creator extraordinaire, mother, and all around super helpful (and hilarious!) She’s going to help us with choosing the right head scarves for our skin tones and learning how to match colors with beauty and ease. Oh, and she just so happens to look gorgeous in tichels, so we’ll hopefully be seeing some modeling from her too! Woohoo!! My name is Tamar Adina. 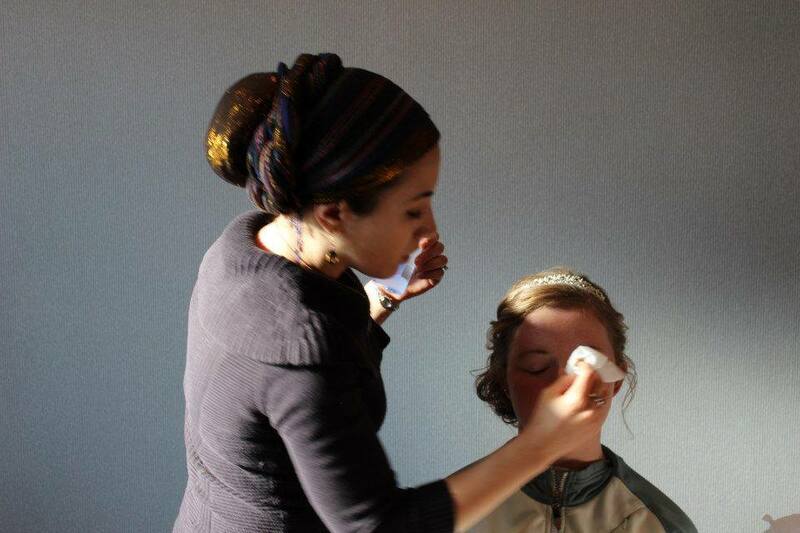 Some of you might remember me from a post on Rivka Malka’s blog about henna. 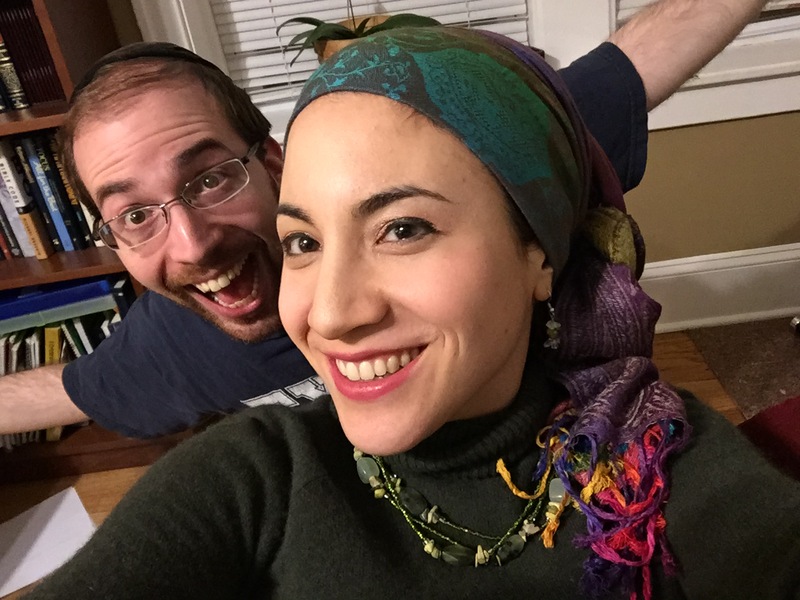 Andrea asked me to talk about when I started covering my hair, how I cover my hair, my sense of color, my sense of style, and some advice that helps someone pick tichels. To understand my rationale, you need to understand that I was the kid in elementary school pictures that had eight feet of hair standing up in all directions. I used to tell friends that I had styled my hair that morning by sticking my finger into the nearest electric socket. To better explain the problem, imagine Hermione Granger (not the movie version where her hair was barely frizzy, the version that you had in your head before Warner Brother’s made Hermione synonymous with Emma Watson). Now imagine that Hermione’s hair was black and that you were the one that needed to take hours of time to tame that mess into submission. Makes sense now, doesn’t it? However, as someone that looked forward to covering her hair, I was surprised to find myself exasperated with the concept. Oh, don’t get me wrong, I loved the thought of not having to make my hair presentable to the public, but the pre-tied tichel that I packed to wear to my new apartment slipped back every .05 seconds. It turns out that lycra can be an incredibly slippery material. Who knew? Since I didn’t want ¾ of my head showing, I started trying to find a solution that I was comfortable with wearing. 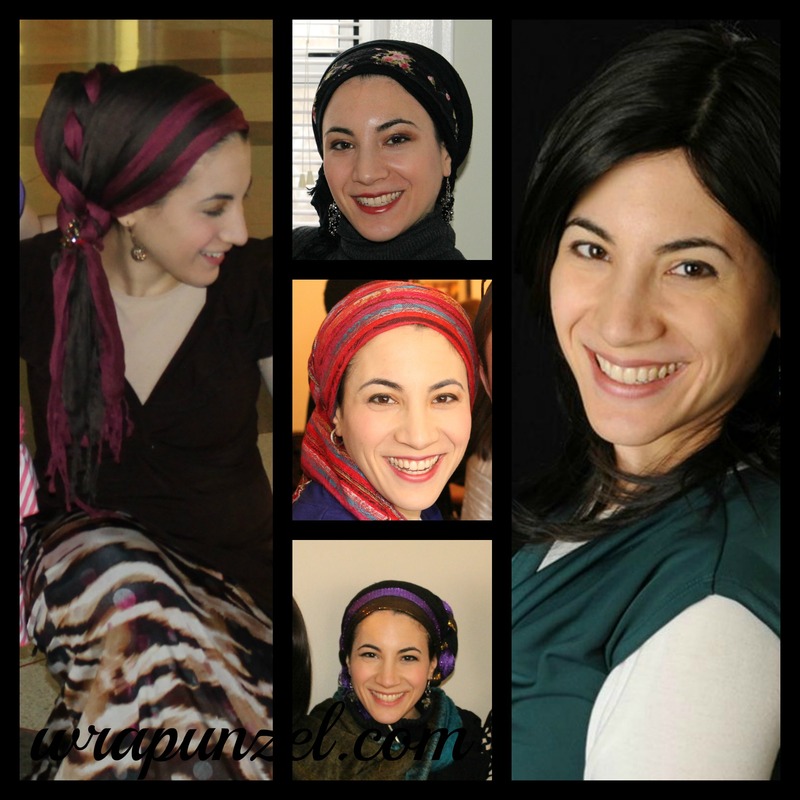 For my first sheva brachos, I tried to wear a sheitel. To be fair, I didn’t understand the concept that a precut isn’t really cut, I could barely put the darn thing on, and I looked ridiculous. The side swept “bangs” fell into my eyes every two seconds, the combs pulled in all of the wrong places, and I felt like my scalp was overheating. Although there might still be some photos on Facebook, I’m pretty sure that I deleted 99% of them from my sister’s camera. But in the interim, I kept searching. My sister-in-law brought me a half a dozen rectangular scarves from Israel. Sadly, I had no clue how to tie them. I went through a phase of wearing hats, snoods, pre-tieds, but everything eventually slipped off my head. I had a number of Israeli tichels, but I couldn’t figure out how to tie those properly either. I’d make a low bun in the back of my head, tie a haphazard triangle, pin the living daylights out of it with bobby pins, and every two hours over the course of the day I’d rinse and repeat the process. So I stuck with either a sheitel, a black snood that I stole from my mother, or a pre-tied. But none of those options really worked well for me. During undergrad and my multiple various volunteer hours, practicums, and internships I wore a pre-tied. Nobody really said anything to me, but there were times when I felt underdressed. After graduation when I started to work as a high school teacher, I wore a sheitel, but I found myself exasperated by how dirty it would become from the horrid combination of chalk and expo markers. I wanted to be professional, but I became easily annoyed with hair that required upwards of $25 to clean, that always fell straight over my eyes, and that over time “died” on me. Maybe if I’d have spent more on my sheitels I would have felt differently, but considering that I had become accustomed to eating, $2100 just wasn’t in my budget. I spent my weekends and summer working as a face painter, makeup artist, and henna artist. While painting, I needed something that a child couldn’t pull off my head and that wouldn’t fall into my eyes while I was working. I settled for pre-tieds, but most of them couldn’t contain my hair, they’d eventually rip, and every once in a while, a child would make a grab for the applique. But I had no other options. Until one day I met Andrea. Andrea and I actually first met on Facebook way before Wrapunzel became an Internet sensation. I posted a picture of a skirt for sale and she called instant dibs on it. For reasons that I still cannot quite understand, that skirt is still in my closet and Andrea still talks to me. Andrea handed me a velvet headband, advised me to put my bun higher up on my head, and showed me how to tie a rectangular scarf. It was a light bulb moment. However that would be lying. It took me about two years to really become comfortable playing with different fabrics, colors, and textures — and I’m an artist! But, I walked into my grad school internship with a tichel on my head and the conviction that my wrap wouldn’t detract from my abilities to be seen as a competent professional. Although at first I sometimes questioned my decision on Facebook, I learned to tie on a tichel and then walk into multiple job fairs, interviews, and finally, this year, I walked into a classroom of 21 high school juniors…and my hair was wrapped. Because I have learned a number of tricks that really help me out. As a makeup artist and a painter, I play with color schemes…a lot. And hopefully some of my issues can help you. 1) My first tip doesn’t actually have anything to do with color. Instead, it’s to find one tie that you like, and learn to do it well. Even after two years of doing hair wrapping, I tend to wear the same three (yep, 3!) ties. That doesn’t mean that I constantly wear the same thing! I vary the scarf color, texture, accessories, etc. But these photos are all the same tie. 2) I find that I personally cannot wear a long tail. By that same token, I cannot wear a long braided tail, a double tail, or even the newly popular Shira tails. I find that long tails wind up in my face paints – and that’s not ok. I used to primarily wear square scarves with a twist, but pashminas and other rectangular patterned scarves looked like too fun to exclude from my wardrobe and so last year I started wearing rectangular scarves more. I tend to wear a maximum of a shoulder length tail on one side of my face. 3) Wrapping highlights your face. So, I personally find that when I fix my eyebrows and put on some concealer to hide the bags under my eyes, I help focus on my better features (my eyes!). But, if I’m completely out of time, I put on a pair of earrings – they serve as a focal point and can help draw someone’s eye away from the fact that I graded twenty-one final term papers the night before. 4) My next tip goes back to color. Grab a color wheel, and use it to create analogous and split-complementary color schemes! Many people have heard of analogous color schemes. They involve colors that are next to each other on the color wheel. They usually match well and create serene and comfortable designs. Most people have heard of complementary color schemes, when two colors are opposite each other (like red/green). But these can actually be harsh and quite difficult to pull together properly. Instead, aim for a split-complementary color scheme. This uses a base color and then the two colors that are adjacent to its complement. This gives a strong visual contrast, but it has less tension, and it’s fairly goof proof. 5) Next, color behaves in relation to other colors. Basically, the relationship of warmth or coolness of respective hues can cause noticeable differences in the perception of color. This can mean that a tichel kit that looked harmonious on the model looks horrifying on you. What color is making the amazing tichel look horrid? Why…your skin color of course! The exact specifics of this can be a little lengthy, but basically there are two basic skin tones – cool and warm. You can determine which category you fall into by investigating the color of the veins on the underside of your arm. If the veins show through blue, you’ve got blue or white undertones, meaning that you have a cool skin tone. Those with green veins have yellow undertones and are therefore warm. If you can’t tell what color your veins are, grab two pieces of jewelry: one gold and one silver. Hold them up against your skin. Depending on which one stands out, you can determine your skin tone. Gold means warm, and silver means cool. Still confused? Grab a piece of yellow fabric and place it next to your face. A warm-tone will have a bright complexion, minimal shadows, and an overall healthy look. A cool-toned person will look like she has had the stomach flu for the last ten hours. If this horrible transformation has happened to you, attempt a blue fabric next. If it gives you the same healthy glow that I promised the warm-toned folks with the yellow fabric, then you are cool toned. Great…so what do you do with that information? Well…now you make tichel combinations! Warm skin tones look for colors on the “warm” side of the color wheel like red, orange, yellow, brown, and pink. Cool skin tones look best in richer colors and those on the “cool” side of the color wheel, like blue, purple, and green. The shade of a color affects where it falls on the warm-cool spectrum. For example, purple with more blue or gray undertones works well for cool colored skin. But, if the scarf has pronounced red or magenta undertones it is better suited for a warmer toned person. 6) Lastly, find a time to try out new designs when you are NOT rushed. Although we already all tend to ask for help with special occasion wraps, it’s the tichel tantrums that occur on a random morning that can make you want to give up wrapping permanently. I find that for me, tichel tantrums come from trying something new. I personally know that it’s not a good idea for me to come up with new scarf combinations in the morning before work. When I am getting ready for work I typically have 15-20 minutes to go from stepping out of the shower to out the door. So, I grab combinations that I’ve tried at least two times before. I tend to play with new tichel ideas on Shabbos afternoon or later in the evening. I hope these tips are helpful! I’m really looking forward to expanding on some of these ideas and having intricate discussions about earrings (love them! ), clip on flowers (not my style), color combos (that include options for all skin tones), makeup (yeah, as a makeup artist, that’s one of my favorite topics!) and how to look professional in a tichel. I can’t wait to catch up with ya’ll! looking forward to getting more tips about colour combinations! Listen up, ladies! Tamar is a wonderful artist with a phenomenal eye for color and style. She loves to share and is a great teacher; we are so lucky to have as a wrap star! Tamar thank you for taking the time to explain these color theories. Nice post! It’s so wonderful that you feature all these amazing and inspiring women! Is there any chance to contact Tamar Adina or Naomi Rose (had the pleasure to meet her in Jerusalem at the Wrapunzel show!) personally other than via Facebook? Thank you so much! Hi! Facebook is the best way, and then if she’s comfortable she can forward you her contact info! I’ll ask her! Unfortunately, I am not on Facebook and don’t plan to. However, if you could ask Tamar Adina if she is comfortable with personal contact, I’d really appreciate that! Thank you! Please email me at wrapunzelthestore@gmail.com and I’ll forward your email to her! Welcome Tamar! Will be looking forward to more posts with informative tips! Tamar mentioned she utilizes 3 main ties- mind telling us what they are? I’d love to hear more about what Tamar means re: “how to look professional in a tichel.” Friends of mine who live outside of Israel and work as lawyers, businesswomen, etc. 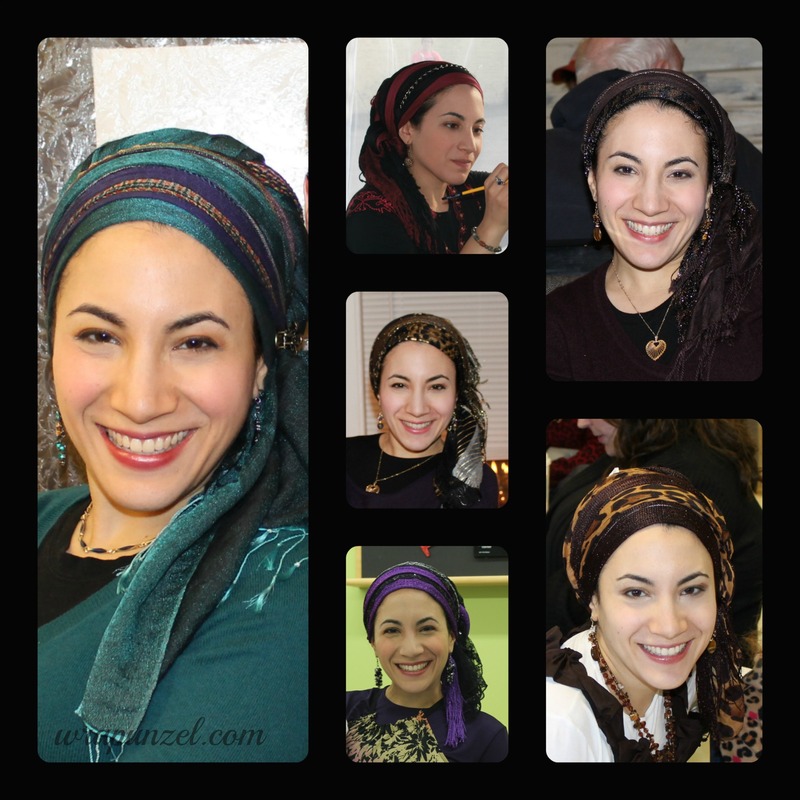 have expressed the concern that wearing a tichel into a business meeting or courtroom would look unprofessional, and I’m curious to hear a response to that. Thanks for keeping up the great work! Love this! More more more! This has been such a helpful post! I tend toward dark/black in my clothing and so my most-used scarf is also black. It is amazing how much rosier and better I look with a warm color on first, closest to my face, and contrasted with my trusty ol’ black scarf. Thanks! What is the wrap in the collage, where Adina said that each picture is of the same wrap?